Any domestic violence situation can be overwhelming and emotional for all parties involved. Massachusetts domestic violence laws are taken very serious by authorities. There can be devastating consequences for families who have to deal with any kind of domestic violence case. Because of the high level of emotions involved, having a clear-headed and experienced attorney on your side can help you get the situation resolved in the best way possible. Stephen M. Forlizzi is a domestic violence attorney in MA and can help explain the domestic violence laws in Massachusetts and how they can affect your particular situation. We will take the time to listen to your case and your needs. Then, we will devise a plan to best help you and everyone involved deal with a domestic violence charge. Domestic violence is taken very seriously in Massachusetts. It can affect the accused person’s job, living arrangements, or ability to own a firearm. A domestic violence situation can also be a big factor if there is also a divorce or child custody case between the parties. It can even influence family court cases years down the road. When the police are called to the scene of potential domestic violence scenario, they will make an arrest. Then, the details of the situation get sorted. It can be difficult for outside parties to fully grasp the scope of what may have happened and how it will affect a relationship or family. Because of the complexities involved, it is vital that you have the Law Office of Stephen M. Forlizzi in your corner. We can help sort out those details in a calm and clear setting. We will ensure your rights are protected and help protect your family too. During what may be a difficult time, knowing your legal options is a must. 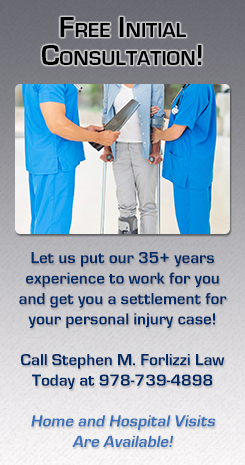 Knowing you have a compassionate and experienced legal professional by your side every step of the way is a must also. Call our firm as soon as you have become involved in any kind of domestic violence situation so we can start to work on getting the best possible resolution. Our knowledge, guidance, and representation can mean the difference between a favorable outcome and a legal nightmare. Let the Law Office of Stephen M. Forlizzi see if we can help you through this difficult time. If you think you’re being falsely accused of domestic violence and want to speak with a criminal defense attorney in MA, and then contact us today for a free case evaluation. 978-739-4898.